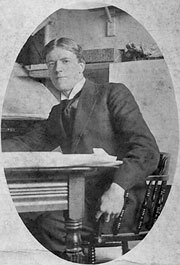 On completing his education, Williams worked in succession for the English subsidiaries of two American-owned reinforced concrete engineering firms: the Indented Bar & Concrete Engineering Company (assistant engineer, 1911-12) and the Trussed Concrete Steel Company (senior designer, later chief estimating engineer, 1912-6, including 1913-14 as resident engineer in Swansea). Use of reinforced concrete was spreading rapidly in Britain, but exploration of the structural and architectural possibilities of the material derived largely from Europe and the USA. The profession of structural engineering did not yet exist as such: "engineering" largely meant civil engineering, and architects or builders wishing to make use of emerging concrete technologies would subcontract structural work to one of several firms  such as the two for which Williams worked  that peddled their own, patented reinforcement technique. Indeed, the rise of the structural engineer was inextricably linked with the invention and proliferation of reinforced concrete in building  so much so that the Concrete Institute, founded in 1908, was to become, in 1922, the Institution of Structural Engineers. Thus Williams entered the field in the early days of both a technology and a profession  at least, for Britain. Among numerous projects in which he was involved on behalf of the Trussed Concrete & Steel Company is the Gramophone Company Building under chief engineer, A. Henderson  notable as the first factory building on which Williams is known to have worked. The outbreak of World War I necessitated the rapid construction of many more factories. Timber shortages made the use of in situ concrete, with its requirement for timber forms, less practical, and Williams' work for the company included the development of various precast concrete systems. It was during this period, too, that he became friends with a colleague, Thomas S. Vandy, who was to be an important collaborator over the following decades. Williams applied, and was accepted, for associate membership of the Institution of Civil Engineers in 1915; he married Gwladys Clarissa Tustian on 31 July the same year. In 1916, however, he seems to have been bitten by a different bug than civil engineering. For reasons that have not been established, he left the Trussed Concrete Steel Company for the Wells Aviation Company, where he worked as assistant aeroplane designer on the design of a flying boat. Those who knew him speculate that he may have been in search of new challenges; he was elected Associate Fellow of the Royal Aeronautical Society in 1917. This anomalous period ended the same year when the company was wound up and Williams began work on one of 21 similar research and development projects initiated by the Admiralty as part of the war effort. Based in Poole, Dorset, he devoted the remainder of the war to experimentation into the use of concrete for ship-building. This gave him his most in-depth appreciation yet of both the negative attributes and the vast potential of the material. The success of his work  he was responsible for the building of 12 ships and 21 slipways as well as numerous test reports, articles and patents  was apparent in the interest it generated. On 17th September 1917 he wrote to his sister, Maud, on the stationery of the Marine & General Concrete Construction Syndicate Limited (Williams System of Ship Construction), “Today I have had Churchill, Geddes, Shipping Controller, Admiralty Controller and a few others impressing on me the necessity of dispatch in my new scheme. It seems all like a dream...”. He was 27 years old. 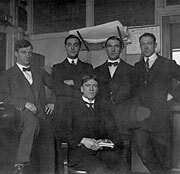 with staff at the Admiralty dockyard office, taken circa 1918.